In the fall semester of 1986, I began my public-history graduate program at UAlbany. As I look back these 30-plus years, I have only fond memories of that time and of my friendship with Professor Ivan Steen. He has been, and continues to be, a tremendous teacher and adviser, and a great inspiration. I believe my success is due, at least in part, to his sincere support and mentorship. 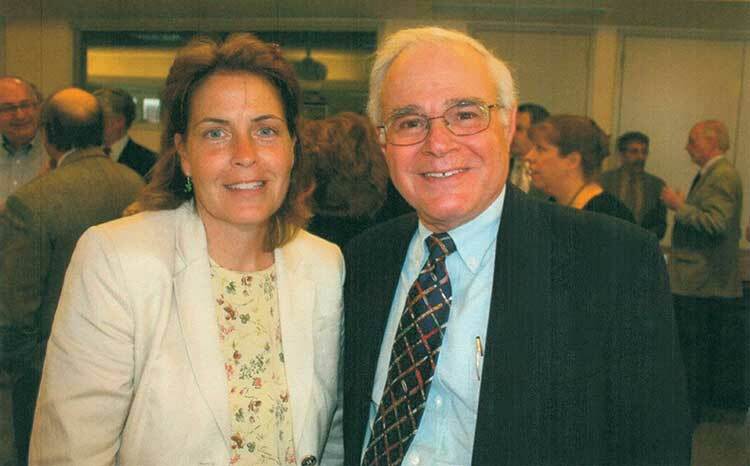 Alumna Diane Conroy-LaCivita posed for a photo with Professor of History Ivan Steen at his retirement party several years ago. I was initially introduced to Professor Steen when I applied to the program. I was subsequently chosen as a graduate assistant, and it was by chance that I was assigned to work with him. He was teaching History of the American City, which attracted hundreds of students every time it was offered. In addition to helping with his office hours and collecting assignments and tests, I aided him with his research pertaining to [longtime Albany] Mayor Erastus Corning 2nd. Professor Steen also introduced me to the importance of capturing oral history in our ever-changing society. Even after my assistantship ended, we remained friends. Professor Steen attended my wedding, and he stayed in touch as my three children have grown and throughout my various career changes. In fact, he helped me get a wonderful job with the New York State Martin Luther King Jr. Commission under Gov. Mario M. Cuomo. I worked there until 1995 in a position I would have never pursued without him. Professor Steen has sat on boards where I have worked and counseled me throughout my career. To this day, we still have lunch several times a year. I appreciate his input and consider him a close friend and confidant. I want to express my deepest gratitude for Professor Steen’s belief in me some 30 years ago. He inspired me to pursue my goals with hard work and dedication. He has shown me the value of honesty, humility, sincerity, trust and education. I truly appreciate and value everything I have learned from him. Those lessons will forever remain major contributions to my success and achievements.